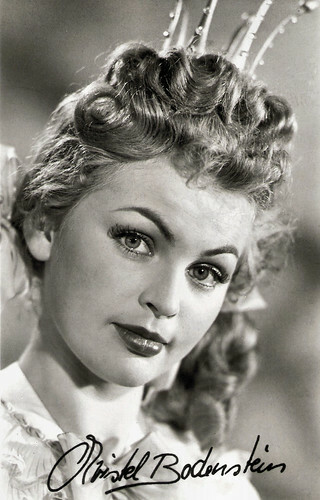 German film and television actress Christel Bodenstein (1938) appeared in many East German (GDR) productions and is best known for her leading role as the beautiful but haughty princess in the fairy-tale film Das singende, klingende Bäumchen/The Singing Ringing Tree (1957). East-German postcard by VEB Progress Film-Vertrieb, no. 1582, 1961. East-German postcard by VEB Progress Film-Vertrieb, no. 2250, 1965. Photo: DEWAG / Herbst / Mücke. East-German postcard by VEB Progress Film-Vertrieb, no. 2252, 1965. Photo: DEWAG / Herbst / Mücke. East-German postcard by VEB Progress Film-Vertrieb, no. 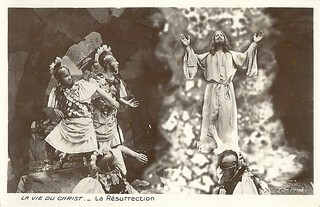 1893, 1963. Photo: DEFA / Blümel. 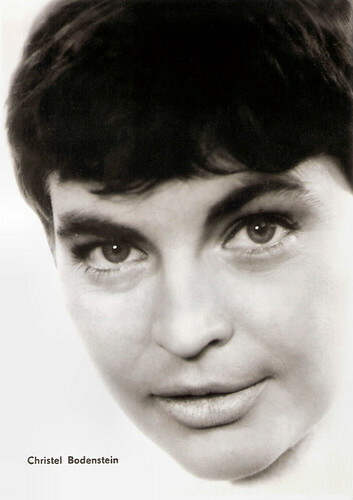 Christel Bodenstein was born Christa Bodenstein in 1938 in Munich, Germany. In 1949, she moved to Leipzig in the GDR with her mother. She attended the ballet school of the Leipzig Opera and the State Ballet School, Berlin. In 1955, she graduated there and became a ballet dancer at the Landestheater Halle. The then 17-year-old met DEFA director Kurt Maetzig at the Ostseestrand. 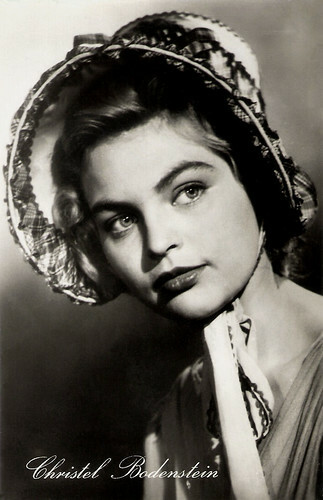 He suggested her to do screen test for the part of Annegret in his DEFA film Schlösser und Katen/Castles and Cottages (1957), but she did not get the role. Instead actress Karla Runkehl was chosen to play Annegret. 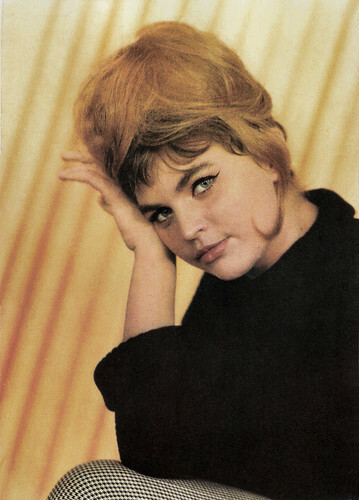 Despite this failure, Bodenstein studied until 1959 at the Academy of Film and Television in Potsdam. 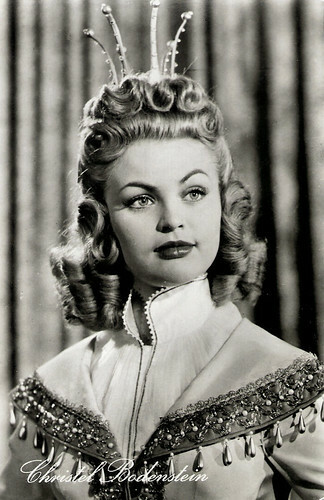 She made her film debut as student Hannelore Ulrich in the satire Das Hauptmann von Köln/The Captain from Cologne (Slatan Dudow, 1956) starring Rolf Ludwig, followed by the fairy-tale film Das tapfere Schneiderlein/The Brave Little Tailor (Helmut Spieß, 1956) with Kurt Schmidtchen. The film was the first of 19 adaptations of Grimm fairy tales, which the East German studio DEFA realised until 1990. 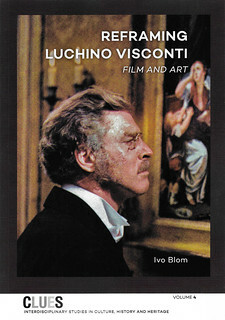 Bodenstein’s breakthrough was another fairy-tale film by the DEFA, Das singende, klingende Bäumchen/The Singing Ringing Tree (Francesco Stefani, 1957). The story, written by Anne Geelhaar, was based on a variation of Hurleburlebutz by the Grimm Brothers. Bodenstein played a beautiful but selfish and haughty princess who rejects the proposal of a wealthy prince (Eckart Dux). 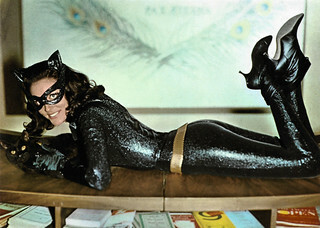 After its release in East Germany, the film sold almost 6 million tickets in the country of about 17 million. Das singende, klingende Bäumchen was then purchased by the BBC and cut into three parts to create a mini-series which was shown many times during the 1960s and 1970s. 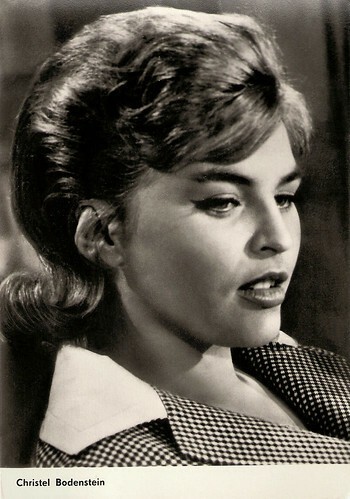 Other popular successes were the DEFA musical Maibowle/The Punch Bowl (Günter Reisch, 1959) and its sequel Silvesterpunsch/New Year's Eve Punch (Günter Reisch, 1960), in which she costarred with Erich Franz, Friedel Nowack and Erika Dunkelmann. In these films, she could show off her dancing talent. 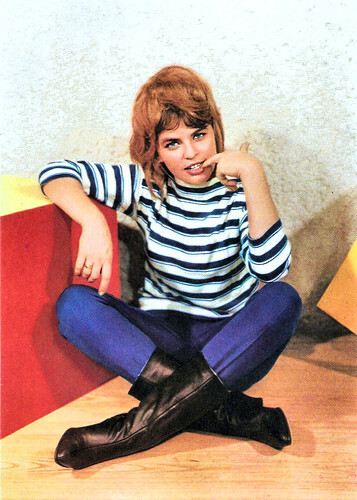 East-German postcard by VEB DEFA-Studio für Spielfilme, Potsdam-Babelsberg, no. 72, 1956. Photo: DEFA / Wenzel. East-German postcard by VEB Progress Film-Vertrieb, no. 4213/447, 1957. Photo: DEFA / Wunsch. 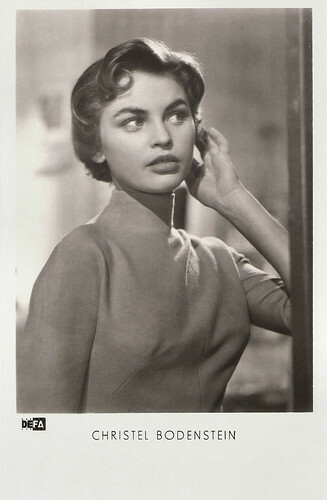 Publicity still for Das singende, klingende Bäumchen/The Singing Ringing Tree (Francesco Stefani, 1957). East-German postcard by VEB Progress Film-Vertrieb, no. 4219/463, 1958. Photo: DEFA / Wunsch. Publicity still for Das singende, klingende Bäumchen/The Singing Ringing Tree (Francesco Stefani, 1957). East-German postcard by VEB Progress Film-Vertrieb, no. 659, 1958. Photo: Jochen Diestelmann. 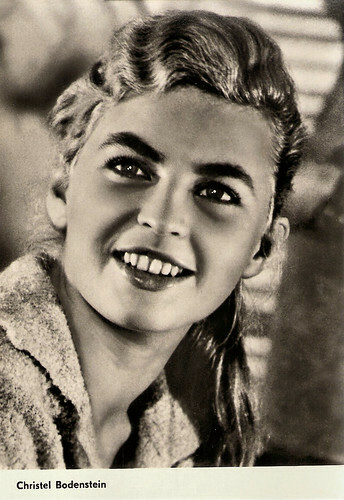 In 1960, Christel Bodenstein was voted the most popular actress of the GDR by the youth magazine Neues Leben. 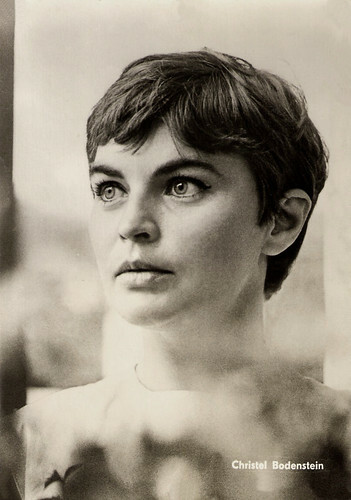 Through her popularity, she became a member of the DEFA ensemble from 1959 to 1973 and she worked with renowned film directors such as Frank Vogel, Herbert Ballmann and Martin Hellberg. 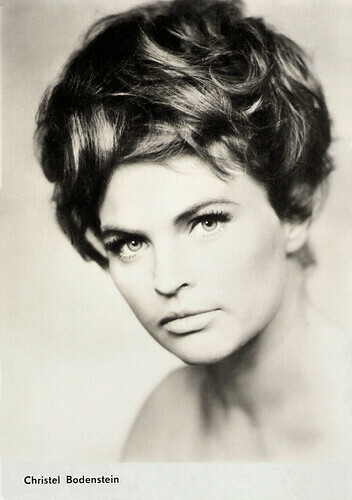 Bodenstein married director Konrad Wolf in 1960 and they had a son Mirko in 1961. 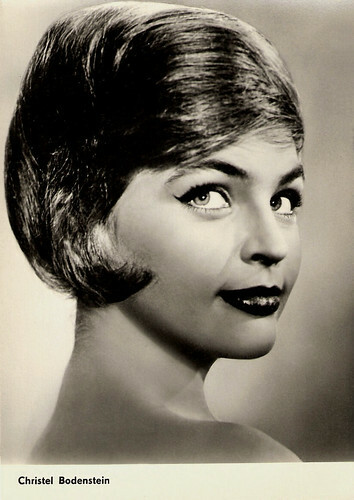 In the 1960s, she appeared in some musicals and revue films such as Revue um Mitternacht/Midnight Review (Gottfried Kolditz, 1962) alongside Manfred Krug. Bodenstein and Krug reunited in Beschreibung eines Sommers/Description of a summer (Ralf Kirsten, 1963). The film made them one of the great romantic couples of the GDR. This was followed by the fairy-tale film Der kleine Prinz/The Little Prince (Konrad Wolf, 1966) based on the story by Antoine de Saint-Exupéry. Bodenstein played the prince and Eberhard Esche the pilot. In the 1970s, good and interesting film roles for the DEFA and the television of the GDR failed to materialise. She decided to return to the stage. 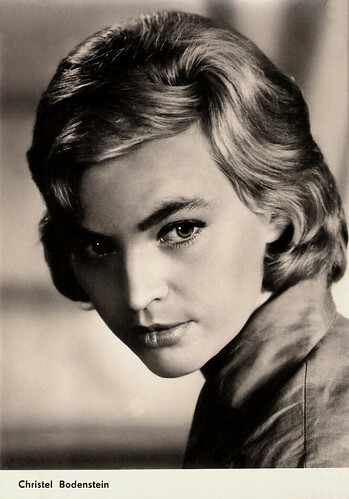 From 1973 to 1976 she performed as a chanson singer, and was a temporary guest actress at the Maxim Gorki Theater in Berlin and the Hans Otto Theater in Potsdam. In 1976, she started to work for the small theatre Das Ei at the Friedrichstadt-Palast in Berlin. After the Wende, the German reunification of 1990, she worked as an assistant director and in 1994 she became a director at Berlin’s Friedrichstadtpalast. Since then, her productions included a Claire Waldorff revue and the revue Sommernachtsträume/Summer nights dreams (1995). Bodenstein and Wolf divorced in 1978. Her second marriage is to the actor and playwright Hasso von Lenski. In 2016, Christel Bodenstein returned to the screen in a new TV version of Das singende, klingende Bäumchen/The Singing Ringing Tree (Wolfgang Eißler, 2016), now with Jytte-Merle Böhrnsen as the princess and with Bodenstein in a supporting part as a herbalist. East-German postcard by VEB Progress Film-Vertrieb, no. 1658, 1962. East-German postcard by VEB Progress Film-Vertrieb, no. 1817, 1963. Photo: Karin Blasig. East-German postcard by VEB Progress Film-Vertrieb, no. 2333, 1966. Photo: Karin Blasig. East-German postcard by VEB Progress Film-Vertrieb, no. 3312, 1968. Photo: Karin Blasig. East-German postcard by VEB Progress Film-Vertrieb, no. 55/69, 1969. Photo: Klaus D. Schwarz. Sources: Ines Walk (Film-Zeit.de – German), Filmportal.de, Wikipedia (English and German), and IMDb.